Layer Road was a stadium located in a residential area just over a mile south of Colchester town centre. It was built in 1910, originally for use by Colchester Town FC. When Colchester United FC were formed in 1937 they took over the ground and played there until 2008 when the club moved to a new 10,000 all-seater stadium on the outskirts of town. My first visit to Layer Road was on 12th February 1994 to see Colchester United lose 2-0 to Chesterfield in a Football League Division Three match. 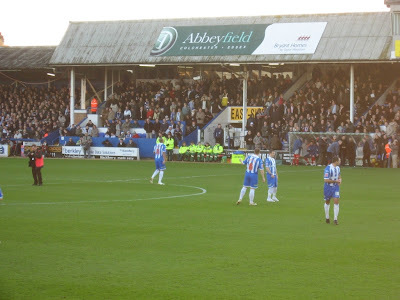 Over the years I attended dozens of games at the stadium with my final visit there coming on 26th December 2007, witnessing Colchester United draw 1-1 with Southampton in a Football League Championship match. The photographs in this post are from 16th December 2006 when I saw Colchester United beat Stoke City 3-0 in a Football League Championship match. By the time the stadium closed in 2008 its capacity was just 6,320 and it was accepted that this was far too small for a team which at that point was playing in the second tier of English football. The ground was mainly standing terraces with three seating areas. The Clock End, behind the goal on the north-west side of the ground, was the most modern end in the venue. 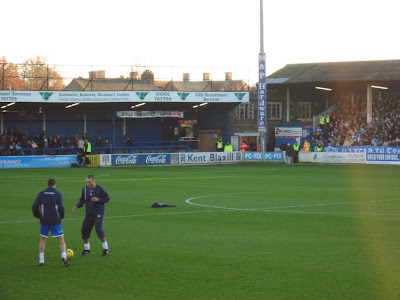 This all-seater stand was used as the family enclosure and had room for just under 800 fans. Adjacent to this on the south-west side was the Main Stand, a rather dilapidated structure with terraced standing split by an all-seater section in the middle. The seating was mostly wooden with some more modern plastic seating added towards the end of the venue's life in front of the main seating and standing areas as the club struggled to cope with greatly increased attendances upon promotion to the second tier of English football. Behind the goal on the south-east side of the ground was the Layer Road End, a cramped standing terraced section which could fit less than 1,000. When away clubs brought small followings they were allocated the right-half of this with the left-half open to home fans but if the away clubs brought large followings they were given the whole stand. Just before the closure of the venue a tiny 143-seat temporary structure was built in the corner of the Barside Stand to allow more away fans into the ground. 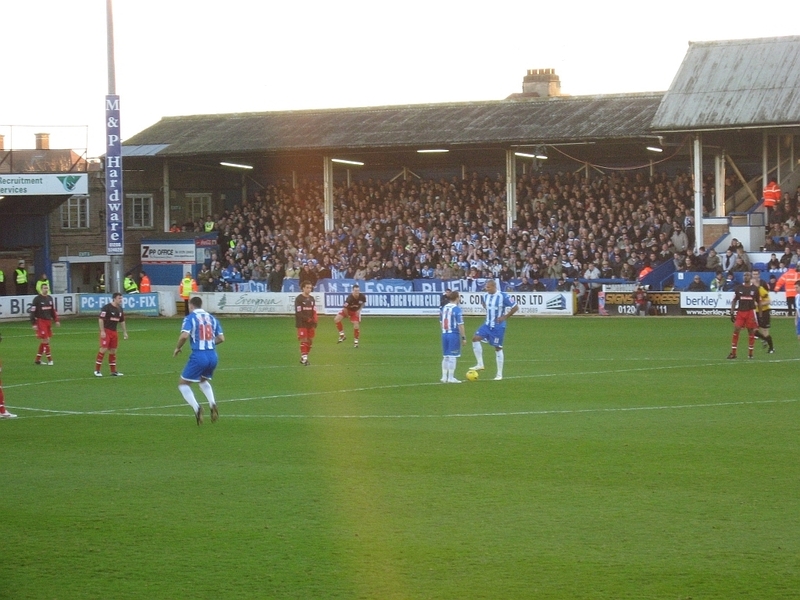 The Barside Stand ran the length of the pitch on the north-east side of the ground and housed much of the more vocal support. This standing terrace was mostly covered by roofing which had a large number of support beams which meant views were restricted. However, there was a section of the Barside Stand towards the Clock End which was uncovered and this was where I watched almost all the games from. 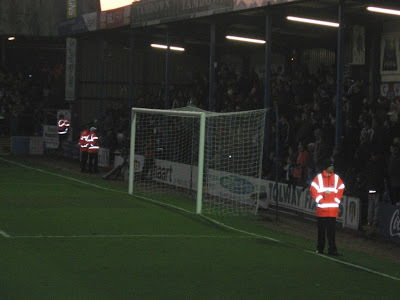 Any fans in this section were usually able to retreat under the covered section of the stand if the weather became too bad but there were not too many occasions where this was an issue. 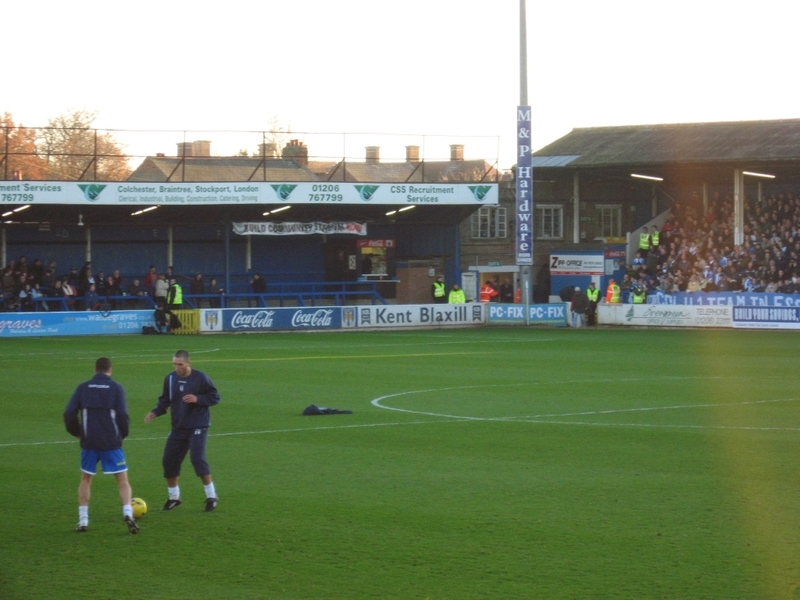 Colchester United played their final match at Layer Road against Stoke City on 26th April 2008 and moved into the Colchester Community Stadium during that summer. Layer Road was left derelict after this and became rather rundown with the place quickly falling apart. In June 2012 the stadium was finally demolished to make way for new houses.